Well, fingerprints of your spouse or child ARE something to be treasured, but if the three figure prices are not in your budget this month, then I have just the tutorial for you!! 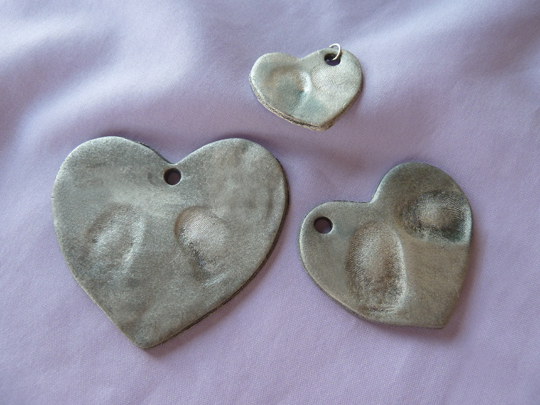 FAUX silver fingerprint pendants! 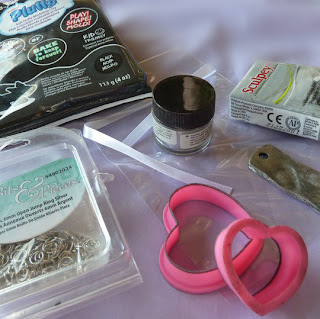 :-) Yup, let's make our own using polymer clay products and a few other simple supplies! 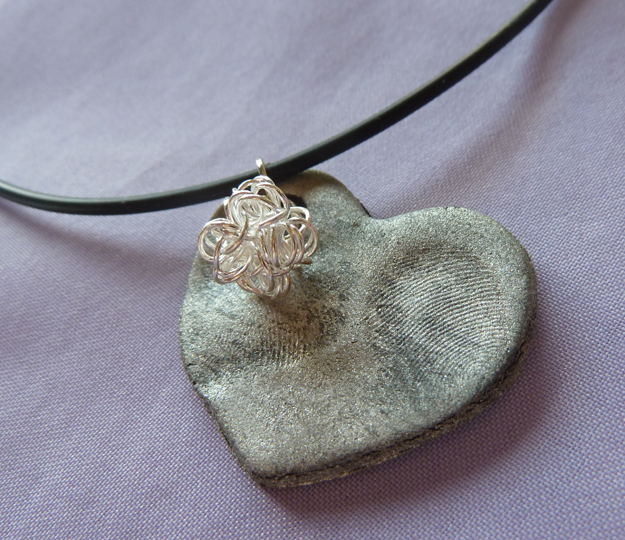 Make a pendant to wear on Valentine's Day, or a gift for the grandparents! How about a large heart ornament, refrigerator magnet, bookmark - just about anything! Supplies: black polymer clay, silver metallic powder, parchment paper, old baking sheet, turkey roasting bag, small heart cookie cutters, play-doh type rolling pin, rubber gloves, toothpick &/or narrow drinking straw, brush or paper towel, clear matte spray sealer, jump ring, necklace, optional bead or jewel, gift bag. I tried silver and black Sculpey. Both require an addition of color for the actual fingerprint grooves to show up better - silver on black looked better to me than black on silver. But feel free to experiment because the supplies are so inexpensive. 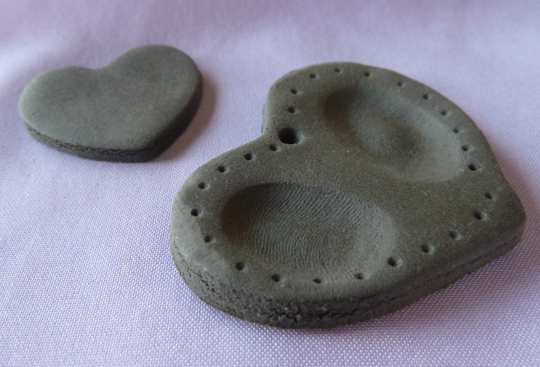 Roll out your black clay, then cut out hearts or whatever shape you desire. Follow the directions on your brand very carefully. Make a heart with one fingerprint and child's name; or in my case, I put my two kids' prints and names on the same heart. Use a toothpick to embellish with any design you like. Use a toothpick or narrow drinking straw to make a hole in the top center or side for threading your ribbon or necklace through. Be sure to date the back, too. The girls at my party did such beautiful work and naturally I forgot to snap pics at the end! Coat the ornaments with metallic silver powder via a slightly damp paper towel. You'll see the fingerprint lines pop. Set on parchment paper, on an old baking sheet pan and tuck into a turkey roasting bag. 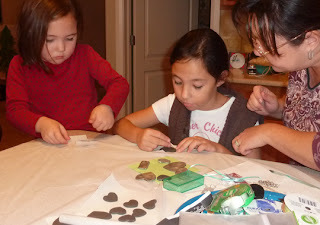 The bag: polymer clay is toxic and will perhaps coat your oven. If you're going to just do this once or twice, probably not a big concern, but gals who work with this clay as a hobby must use a separate craft oven! So, for a couple bucks, play it safe with the bag and also don't let polymer clay touch anything that needs to return to your kitchen. Now that you've baked it according to the directions on your package of clay, and let it cool, spray it with a coat of clear satin or matte sealer. It keeps the silver powder from rubbing off. When it's dry, add a jump ring and thread your necklace and add some bling for a pendant! String it along a pretty ribbon for a bookmark or ornament. Voila! 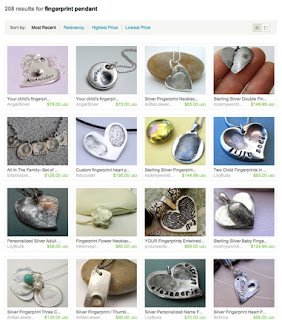 Linking to Today's Creative Blog and Tip Junkie's Tip Me Tuesday and Sugar Bee's Take a Look Tuesday. What a wonderful idea and tutorial!!! Thanks so much for sharing!!! I am obsessed with fingerprint jewelry and pretty much anything with handprints or foot prints on it! I love how you used the silver! This looks great! Thanks so much for sharing! That is so sweet. Perfect craft idea for the kids. amazing idea. i love this. perfect for valentines day gifts. looks like a lot of fun. Just wanted to let you know I featured these on my friday favorites! Thank you for this tutorials, a fun way to spend the weekends with my kids. A fun way to spend time with your kids.